The survey found that about 30 percent of registered voters in the county do identify with the Tea Party. Only 13 percent of the voters are satisfied with the way things are going in the country. President Barack Obama’s job approval rating among Oconee County voters is only 21 percent. Fifty-four percent are opposed to the mandatory health coverage provision of the health reforms proposed by President Obama and passed by the Democratic Congress. Forty-two percent consider themselves to be Republicans, and 38 percent describe themselves as conservatives. But support for the Tea Party is not greatly different from what it is nationally. Satisfaction with the way things are going in the country is at the level of the country as a whole. Oconee County voters’ views on health care reform are similar to those held around the country. Among the county’s Republicans, a third consider themselves to be moderates or liberals, which is nearly the same as in the country at large. And 37 percent of Oconee County’s registered voters consider themselves to be independents or members of a party other than Republican and Democrat, compared with 41 percent nationally. Oconee County voters are more critical of President Obama than citizens in the country as a whole, and they are less Democratic. The two go hand-in, of course. President Obama nationally enjoys strong support among African-American voters, and there few African-Americans in Oconee County. Otherwise, the survey findings indicate, Oconee County voters are not so different from the rest of the country. The students conducted the survey in late October and early November with a scientifically selected sample of Oconee County registered voters. The voters that the students attempted to interview were selected by chance from the voter rolls. The students interviewed 238 voters in the county, most of them by telephone. That represents 20 percent of those they attempted to interview. Though the sample is small, it matches known characteristics of the population of Oconee County registered voters. For example, 53 percent of the registered voters in Oconee County are women, and 54 percent of the 238 interviewed voters were women. Among all voters, 88 percent are classified as White on the voter lists. In the sample of 238 voters interviewed, 92 percent were White. Among all voters, 3 percent are under 20 years of age and 23 percent are 60 years old or older. Among the 238 voters interviewed, 2 percent are under 20, and 24 percent are 60 years old and older. The sample also matched the list of voters in terms of distribution among the county’s 13 precincts and status as active versus inactive voters. All estimates based on samples are likely to have error associated with them. In a scientific survey such as this one, with this size of sample, the error should be plus or minus 6 percentage points 19 times out of 20. In other words, the estimates from the sample should be within plus or minus 6 percent of what would have been learned had all 22,730 registered voters in the county been interviewed. The students conducted the survey to learn about research methods used in the field of mass communication. I was the instructor for the class and purchased the voter registration list for the students to use in the survey. Students in a second section of the class also conducted a survey of Oconee County voters, but only a small number of questions were included in both surveys. Prof. Jeong-Yeob Han was the instructor for the second section. The students in the class selected most of the questions they asked from surveys conducted by national polling organizations, making it possible to compare Oconee County registered voters with the population at large. Those national polls questioned persons 18 years old or older, not just registered voters, so comparisons between the Oconee County findings and the national findings are not exact. Oconee County does have a very high level of voter registration, suggesting that the findings would likely not be radically different in Oconee County had all persons 18 years old or older been included in the study. 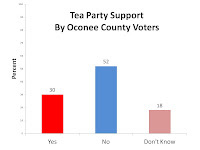 Students in my section asked the Oconee County voters they interviewed: Do you consider yourself to be a supporter of the Tea Party movement, or not? Thirty percent of the Oconee County voters said they were. That compares with 25 percent of the population nationally responding affirmatively to the same question posed to a national sample in early November. That survey was sponsored by NBC and the Wall Street Journal. 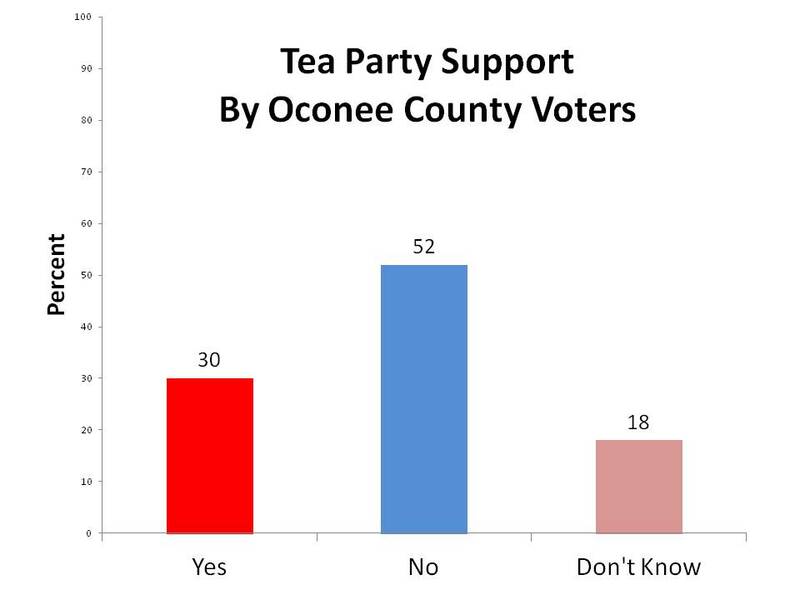 Oconee County did have more persons who did not know if they supported the Tea Party than was the case nationally. Thirteen percent of Oconee County voters said they were satisfied “with the way things are going in this country today,” compared with 12 percent in a national Gallup Poll in early November. The 21 percent job approval rating for Obama in Oconee County compares with a 43 percent job approval rating in Gallup surveys in November. Among those surveyed, 54 percent opposed the provision. In a national survey conducted for CNN in late November, 56 percent said they opposed the legislation in response to a similarly worded question. My students asked Oconee County voters a lengthy questions about the 14th Amendment that had been taken from a June survey for Time Magazines. encourages foreigners to come to the United States solely to enable their future children to be U.S. citizens. Other people say that this is a minor problem and that the Constitution should not be amended for this reason. Which view is closest to your own – revise the Constitution’s 14th Amendment, or not? In Oconee County, 33 percent of the respondents wanted to revise the 14th Amendment. In the Time survey, 35 percent said they wanted to revise the 14th Amendment. Thirty-eight percent of Oconee County voters describe their views on most political matters as conservative. Gallup polls find that 42 percent of the population uses that label to describe their ideology. 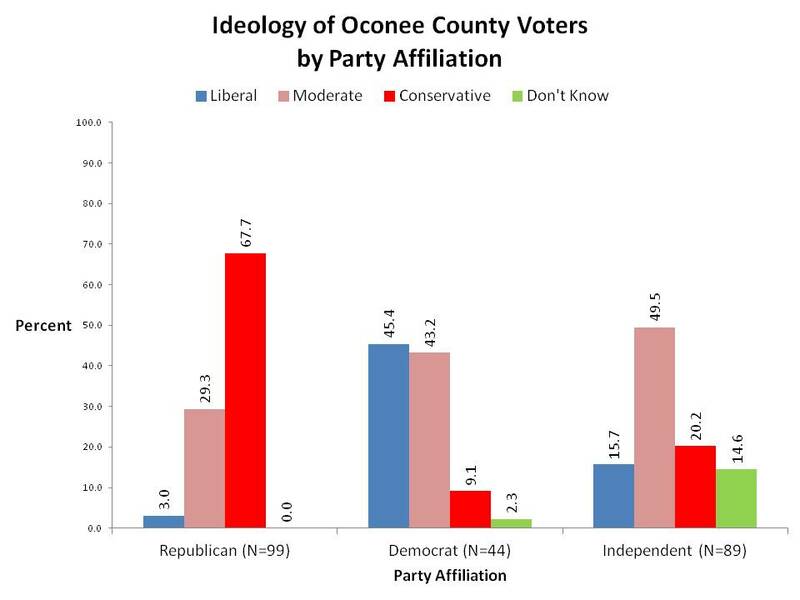 In Oconee County, 16 percent describe themselves as liberals and 40 percent describe themselves as moderates. Nationally, liberals make up 21 percent of the population, and moderates make up 37 percent. Survey organizations use a variety of different ways to ask about party affiliation, which has different meanings in the different states. In Georgia, of course, voters do not register by party, and my students asked Oconee County voters: In politics today, do you consider yourself a Republican, Democrat or independent? Among the 238 Oconee registered voters surveyed, 19 percent said they were Democrats, 37 percent said they were independents or did not know their party affiliation, and 42 percent said they were Republican. Another 2 percent said they were a member of another party. In a survey for CNN in the middle of October, 33 percent said they were Democratic, 41 percent were Independent, and 26 percent were Republican. In Dr. Han’s class, the students asked respondents if they generally think of themselves “as a Democrat, a Republican, an Independent or something else” and then asked those who did not pick either the Democratic or Republican parties if they leaned more to the Democratic or Republican party. Based on responses to this question, 24 percent of Oconee County voters are Democrats or independents leaning to that party, 13 percent are true independents, and 58 percent are Republicans or independents leaning Republican. The national figures, based on Gallup polls and a similar classification, are that 44 percent of the citizens are Democratic or lean Democratic, 16 percent are true independents, and 40 percent are Republicans or lean Republican. Gallup, based on the surveys conducted in the first half of this year, has classified Georgia residents as 43 percent Democratic or leaning Democratic and 41 percent Republican or leaning Republican. Among the Republicans in Oconee County in the survey my students conducted, 3 percent classified themselves as liberal, 29 classified themselves as moderate, and 68 percent said they were conservative. Among Democrats, 45 percent classified themselves as liberal, 43 percent as moderate, 9 as conservative, and the remainder didn’t know how to classify themselves. Among the independents, 16 percent said they were liberal, 49 percent said they were moderate, 20 percent said they were conservative, and 15 percent said they didn’t know how to classify themselves. Gallup found in its June to July surveys of 2011 that 68 percent of Republicans and Republican leaners were conservative and that 37 percent of Democrats and Democratic leaners were liberals. My students selected some questions about marriage from a CBS poll in January of last year for their Oconee County survey. One was: What kind of marriage do you think is the more satisfying way of life -- one where the husband provides for the family and the wife takes care of the house and children, or one where the husband and wife both have jobs, both do housework, and both take care of the children? Twenty-two percent of the Oconee County voters selected the first option where the husband provides for the family and the wife takes care of the house and children. The Time survey found that 24 percent of the respondents selected that option. While the sample error for the Oconee County survey of 6 percent is easy to compute, the error associated with question wording is more difficult to assess. Respondents can interpret questions differently or lack adequate information to answer questions soundly. That makes it difficult to interpret responses to any individual question. The overall pattern of responses, however, indicates that Oconee County is less exceptional, except in terms of party affiliation and related matters, than is often reported. Oconee County’s reputation as a Republican stronghold, of course, is reflected in its voting history. In the March 2008 presidential primary, 66.4 percent of the voters in Oconee County used a Republican ballot, and 33.6 percent used a Democratic ballot. In November of 2008, 71 percent of the voters selected Republican John McCain and only 28 percent selected Democrat Barack Obama in the presidential race. In the November of 2010 election, 70 percent of the Oconee County voters cast their ballots for Republican Nathan Deal in the gubernatorial race and only 24 percent voted for Democrat Roy Barnes. In the July 2011 runoff for the special election to fill the vacancy for the Georgia House of Representatives in Oconee County, Republican Chuck Williams got 70.0 percent of the vote against Democrat Dan Matthews. Some people in both parties are going to vote for the candidate of their party pretty much regardless of alternatives. The data from the survey and the voting history of the county in recent elections suggest that Republican candidates have an edge in the county, but they also suggest that it isn’t necessary to be a conservative candidate to win in the county. I have uploaded a copy of the tables showing the responses of Oconee County voters to the questions used here to the Oconee County Observations Box.net site. Because the national data are presented in whole numbers, I have used whole numbers in presenting the Oconee County data as well.